Despite us humans being the most intelligent among all living organisms it seems we have lowered ourselves to blaming the animals we farm for major environmental concerns, including; climate change, water depletion and pollution, land degradation and soil erosion, deforestation, threats to biodiversity and impacts of excessive material and energy use. Should they be held responsible? The FAO says livestock is a major threat to environment, yet I would say, this is only the case because people are not smart enough to make livestock rearing and agriculture climate smart. We are the culprits. Adapted from ‘Tomato leaf miner/ American leaf miner management in Agricultural production systems (Distribution, biology, damage and integrated management)’ written by Koppert Biological Systems. Greater involvement of women in plant clinics has improved the climate resilience of the farmers in Rohal Suong village, Cambodia. Women farmers play a critical role in agricultural production and food security, as well as household welfare in most Southeast Asian countries. According to a Census of Agriculture in Cambodia in 2013, of the 82% of Cambodians engaged in the agriculture sector, at least half of them were women. A severe infestation of the papaya mealybug (Paracoccus marginatus) nearly wiped out papaya orchards in Pakistan before the largely farmed country decided to replace conventional chemical pesticides that were ineffective with natural predators that proved to be successful. The system was developed by agro-biotechnologists and entomologists at the Pakistani chapter of the UK-based Centre for Agriculture and Bioscience International (CABI) who introduced the use of Acerophagus papayae, a parasitoid (insects whose larvae parasite upon and eventually kill the host), to effectively control the mealybug infestation. Reblogged from the IPPC blog. 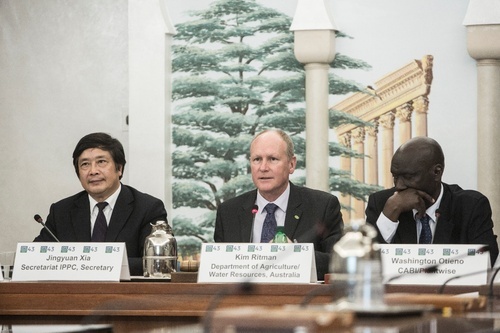 The side event was co-organized by the Secretariat of the International Plant Protection Convention (IPPC) and the Department of Agriculture and Water Resources of Australia with a manifold success. The side event was held during the 43rd Session of the Committee on World Food Security (CFS43) on 18 October 2016, and marked an important event for plant health awareness promotion. The side event was chaired and opened by Mr Jingyuan Xia, the IPPC Secretary; and five distinguished panelists convincingly presented the links between the plant health and food security, including Mr Kim Ritman (Department of Agriculture and Water Resources of Australia), Mr Washington Otieno (CABI), Maria Saponari (Italian National Research Council and CIHEAM), Mr Rui Cardoso Pereira (FAO/IAEA), and Mr Craig Fedchock (IPPC).